During the Christmas chaos, I had time to read some history about our county from the book “Past and Present, Nodaway County Missouri, Volume I” which was published in 1910 by BF Bowen & Co., Indianapolis, IN. It is great fun to read about the political and economic climate of yesteryear that happened right outside our back door. In Chapter XV, my interest peaked. The entire chapter was devoted to county newspapers of that time. There were quite a few. 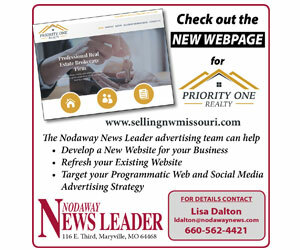 Author WL Moorhead told of communities in the county that were playing “no small part” in stimulating “activity along commercial, political, moral, social and educational lines.” I can see so many similarities with his findings and our mission here at the Nodaway News Leader. While I’m not sure about his gender reference or the idea of a keen intellect, the rest of this thoughts are pretty much right on with our efforts here at the NNL. It is our hope to be a catalyst for change and a vehicle for ideas to be shared and explored. The demise of this paper was during the Cranor campaign in 1861 when the Confederate Rebels raided Snow’s office, throwing the type cases and other material into the street “in front of the office of Joseph Jackson. It is said that the type and slugs of the office were moulded into bullets and used by the Rebels for ammunition, but this is possibly ‘poetry.’” After the office was destroyed, Snow was told to leave not just Maryville but the state, so he went to Kansas. As a side note, his son went into the newspaper biz and was the editor of the Ottawa Journal and later served as the state printer when the Populist Party controlled Kansas. The second paper established in the county seat was the Gazette begun by former Governor Albert P. Morehouse in 1866. Morehouse wanted a paper to publish the delinquent tax list and made an investment of $900 to begin the newspaper. He came out in the clear, profiting $590 with the first publication of the past due tax list. This paper was Republican in politics which instituted changes through the years as the politics of the county and Maryville evolved. Life in Nodaway County is so affected by the printed word in our local newspapers. The coverage of the news, features about our people and places and, of course, the editorial comments found each week here seem to be a regular, common occurrence. But someday, when someone looks back 50 or 100 years from today at past copies of the NNL, I hope they will see the good that our blood, sweat and tears chronicled.